But in this post-PC-only world most tablets are powerful enough to handle the fundamentals of business computing--once you figure out how to fit them into your workflow. To help you tailor your tablet to your professional needs, we asked a few successful entrepreneurs how they made working from a tablet work for them. The biggest challenge in working from your tablet is adapting to the lack of a keyboard and mouse. While it’s possible to pick up a portable Bluetooth keyboard, many professionals find working exclusively on tablets appealing because of their portability, and lugging around a bag brimming with peripherals sort of ruins the point. Instead, download apps that make the tablet's on-screen keyboard work for your needs. For Apple’s iOS, consider an app like Keyboard Upgrade, which allows you to resize and split up the keyboard to make touchscreen typing more comfortable. Unfortunately keyboard apps on the iPad are of limited use since Apple does not currently permit developers to modify the iOS keyboard that pops up in all applications, and thus apps like Keyboard Upgrade require you to copy what you type and paste it into other applications. Android tablet users have it much better thanks to excellent keyboard replacement apps like Thumb Keyboard or SwiftKey Tablet X. You can even try a new way of typing with Swype, and each of these keyboard upgrades will upgrade the default Android keyboard across all Honeycomb apps. Of course, no matter which app you use, trying to duplicate the functionality of a full physical keyboard on a tablet is going to be taxing. The silver lining of this limitation is that many professionals find running their business from a tablet forces them to become more concise when corresponding with clients. Brenda Christensen is the PR Director at Nimble, and she recommends business owners embrace the limitations of their tablets to become better businesspeople. “When responding to email via tablet, quickly getting to the point and avoiding the temptation to go off-topic is paramount,” she explains. Chantel Atkins owns The Rhythmic Lounge, a streaming music website that unites underground artists and musicians. She runs the website almost exclusively from her iPad 2, relying on common business apps like Google Analytics and QuickOffice Pro. For working professionals looking to streamline their business, Chantel recommends the handy Business Card Reader app for the iPad 2. “This app is great; it allows me to instantly import a business card and all of its information,” she says. “There’s no worry about misunderstanding the phone number or email address and possibly losing touch with that connection.” Those using an Android tablet should check out ABBYY, a business card reader that links up with your LinkedIn and Twitter accounts to help you better connect with new business contacts. A tablet is only as good as the apps it runs, but thankfully both iOS and Android have been around long enough to boast app marketplaces brimming with a variety of useful apps. Dan Nainan is a professional comedian, actor and voice-over artist who regularly tours the country while relying on an iPad 2 to run his business from the road. Nainan answers email and takes notes via dictation using the Dragon NaturallySpeaking app, and uses the Talkatone app (along with a Google Voice account) to make free phone calls to the United States and Canada from anywhere in the world. He relies on Flight Track Pro to stay on top of his hectic travel schedule and uses Gas Buddy to find cheap gas for his rental car when he’s on the road in unfamiliar territory. 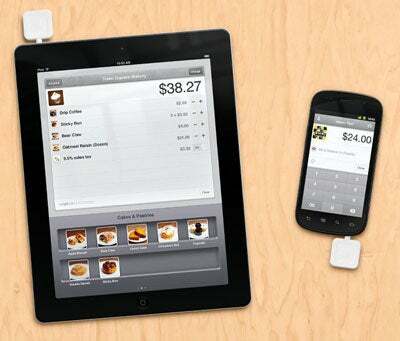 Square card readers plugged into an iPad and a smartphone. Of course you’re not limited to Square if you want to accept credit cards on the road; the mobile payment market is constantly evolving and there are already worthy competitors like Intuit that offer equitably priced mobile payment systems. Professionals working in fields that regularly handle sensitive data are understandably hesitant about migrating their business practices to a tablet, but investment banker Harry Ting conducts most of his business and meetings using just an ASUS Eee Pad Transformer tablet and the accompanying keyboard. Ting works for a boutique firm in Dallas and regularly handles sensitive engagement letters and nondisclosure agreements, storing and sharing the documents via DropBox and validating signatures on the go with the Vignature image-based electronic signature app. Vignature image-based electronic signature app. Ting claims to have gotten great feedback from his coworkers on carrying the Transformer during business meetings, as relying on a tablet makes his firm seem more professional and forward-thinking to prospective clients. More and more businesses are adopting tablets for just that reason, so if you own a tablet for personal use, consider taking a few minutes to transform it into a better business machine. An excellent starting point would be our AppGuide, notably our guide to some of the best productivity apps currently available for the iPad 2 and Android Honeycomb tablets.